I cannot decide what I think of this book. The cover and the premise caught my attention. The writing (especially in the beginning) was bad, but the story kept me interested, and I did finish the book, even though I thought I probably wouldn’t from the first chapters. I’m going with 2.5/5 stars, because the story was entertaining enough, even though the writing got on my nerves. I seriously cannot decide what I think about this book so I’m going to break it into little pieces and talk about each individually. I didn’t like her that much. She felt naive and young, which was fine in the beginning, but she never really grew up over the course of the book. Even at the end she was doing things that rang of childishness. I liked him–strangely. He was weird in what felt like an unoriginal way. 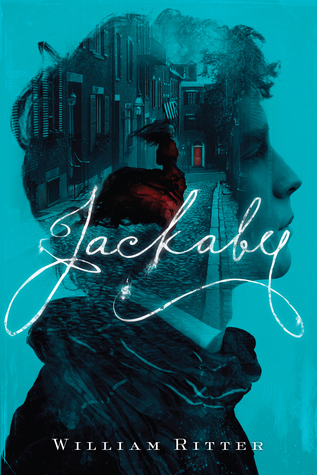 The book is marketed as a mix between Sherlock (the new BBC version) and Doctor Who–and Jackaby felt exactly like a mix of Sherlock and the tenth Doctor (with a bit of Eleven before he went dark thrown in). He was a fun character, but like everything in the book, I was left wondering if he was actually an original character or the byproduct of binge-watching TV and then deciding to write a book. Again, likable but unoriginal. Everything had new names and all the creatures were “original inventions”; however, they felt like new combinations of old traits. Rearranging fantasy troops into new forms isn’t exactly the type of originality I look for in books. It was lame as heck. Seriously not even worthy of a curse word. The love interest, Charlie, was boring and flat. Their relationship was nothing more than a crush–and not even a crush based on cute banter or sweet moments. It was a crush between a girl who blushed around any attractive male (of which he was the only one) and a young man out-of-his-depth who liked the weird detective and his young, blushing assistant. This was endearing at first but it never progressed to anything–so I basically stopped caring. The writing was bad. It felt like a debut author who needed to just write more before getting published. The story could have been infinitely better if the author wrote it better–the ideas behind it were solid, they just required better execution. I liked the banshee. I liked how Ritter didn’t try to create a creature that was-a-banshee-but-wasn’t. The banshee added a level of complexity to the story, especially when she died. I also liked Jenny (the ghost). She was an interesting character, but I wish Ritter had done more with her. She didn’t change or affect the story much and that was a shame. The book took forever to end. The obvious climax happened an then the book dragged on for thirty more pages. The letter attached at the end basically ruined the book for me–and any chance that I would read a sequel–for the main reason of I had stopped caring and the book was still talking. The cover of a book will definitely determine if I buy it or not. I really should spend more time at my library; I could save myself a lot of money 🙂 Thanks for the great post!